So, are you all rested up now that Christmas is over? I hope you were able to enjoyed time with family and friends! Are you ready to ring in the New Year? Can you believe we are coming up on 2015 already! Wow, time just cruises along, ha? Way to fast if you ask me! I have a few projects I will be sharing over the next few days that I didn't get a chance to share yet. So, be sure to pop back over and check them out. Also, thanks to all who have taken the time to visit me and leave such sweet comments through out the year:) I really appreciate it and love reading them! My card base is made with paper from Coordination's which my sweet friend, Diana sent me. I used the Spellbinders Romantic Rectangles for the base and base layer. I embossed it with a snowflake folder by Darice and then lightly sanded it for the green to pop through. 3 1/4 from the Christmas Cheer cartridge and the little holly/berries is from my stash. I finished by added a little charm from Tim Holtz which I grabbed at craft store when I was on a retreat. Loving your snowman! Hope you had a Merry Christmas and Happy New Year! Looking forward to seeing all your amazing projects in 2015! I love the embossing snowflake paper you created. The snowman die is super and I really like his PKS face. 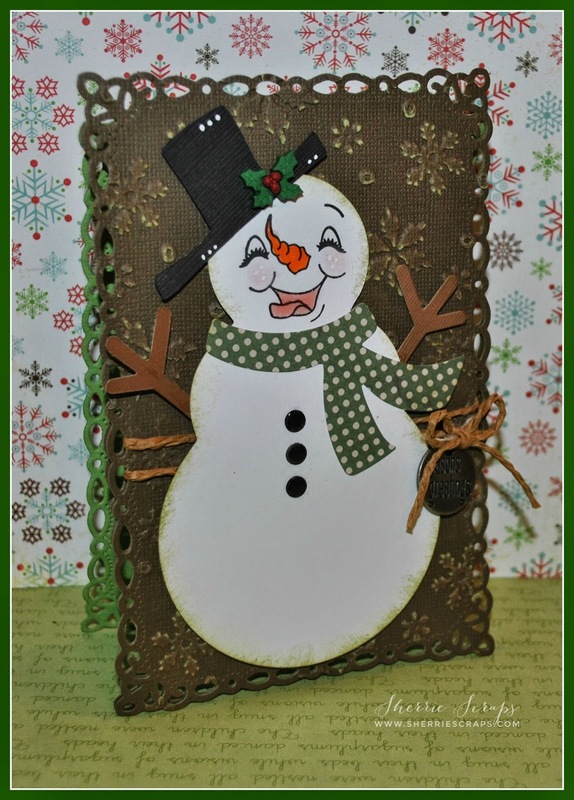 Thank you for joining my DL.ART DECEMBER LINKY CHALLENGE, Have a Blessed day, DIANA L. OMYGOSH!!! Sooooooooo fun! I love love love that snowman!!!!! 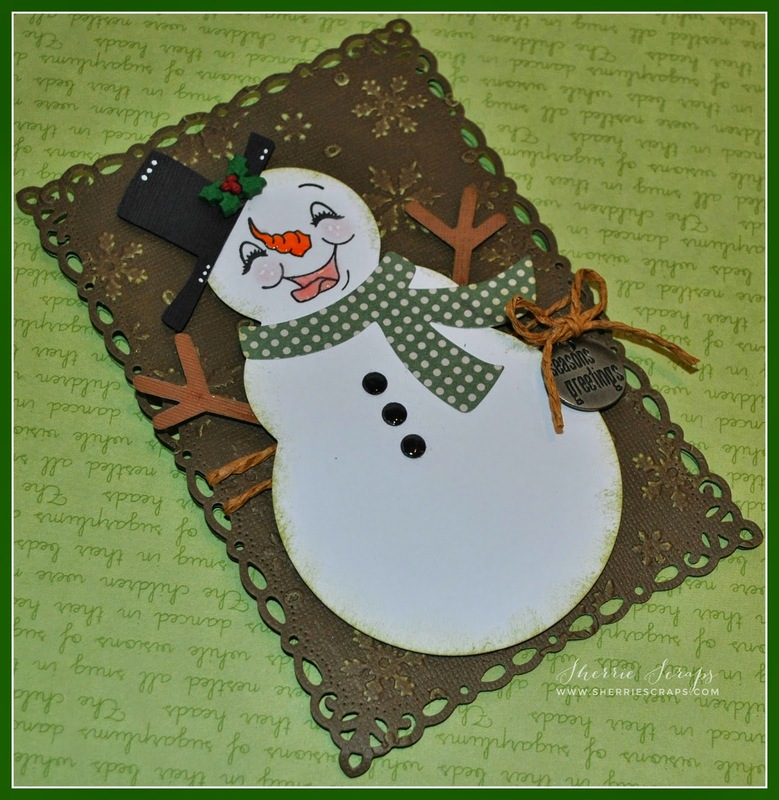 Sherrie, Your Snowman Card is Adorable!!! Hope you have a Great New Year. Super cute project! The embossed background looks amazing and the snowman die is awesome! Love his sweet face! I'm done with Christmas and hope I don't have to make anymore until next Christmas. I'm starting to prep for the New Year and I've made an early resolution that I'm definitely will be starting on time and no more procrastinating like the years before. I even hope to get my Christmas done by summer time....LOL! This is so super adorable Sherrie!!! LOVE that CUTE snowman!!!!! Your Snowman is so adorable! And so is your card! Thanks for playing along with us at Scrapy Land Challenge #8! Can't wait to see what you make in our new challenges in 2015! Cute card. 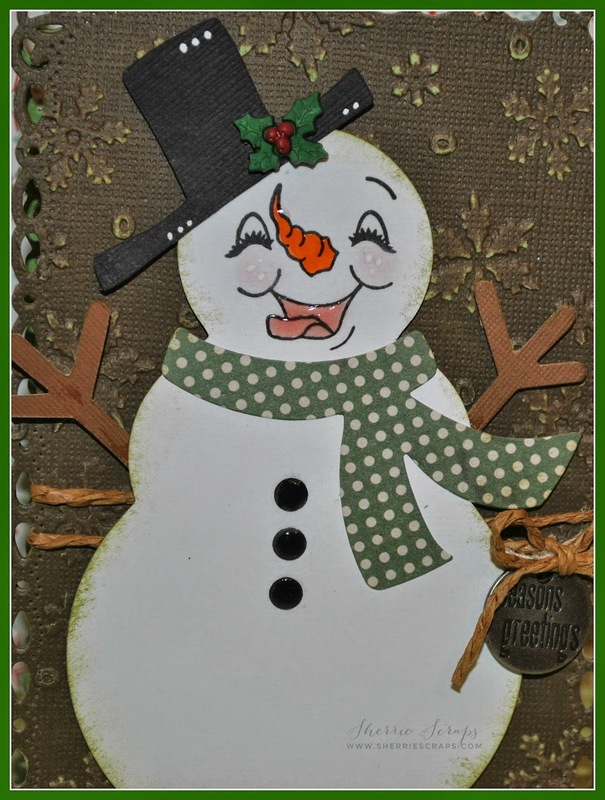 I love the face on the snowman-he is so cheerful. The embossed background turned out great. This is cute as can be! Hard to believe just like that Christmas is over!!! Love the embossed background! The perfect backdrop! What a happy little guy! He really is a cutie and I love that sweet Peachy face. The background of your card is so pretty, love the edges and great embossing. He's so cute. Love that stamped face. Thank you for Linking Up at PDE Linky Party. How darling, Sherrie! I love that you embossed your die cut background and added that extra sanding to create the weathered effect. Such a cute snowman and YES..we had a great holiday and look forward to spending New Year's eve with a portion of my family who lives fairly close. I hope your holiday is happy and blessed! Looking forward to seeing what the new year brings! He's precious and I love your card! Snowmen are always so much fun and this little guy is a happy one. Love his polka dot scarf too! VERY cute card! Thanks so much for joining us at Scrapy Land Challenges! super cute card! That snowman is adorable! Happy New Year! OMG, this is the cutest card. Love the face, so funny. Your Christmas card is adorable and I love the die cut border. So glad you shared it with us for the Scrapy Land Challenge.